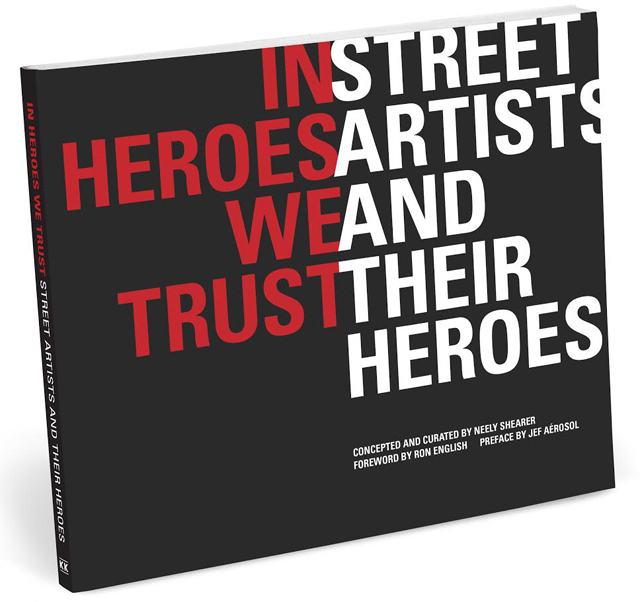 Conceived and curated by Native Californian Neely Shearer, In Heroes We Trust: Street Artists and Their Heroes features the musings and artworks of 60 international artists on the theme of heroism. After reading the elegantly engaging book — with its foreword by Ron English and preface by Jef Aerosol — I posed a few questions to Neely. 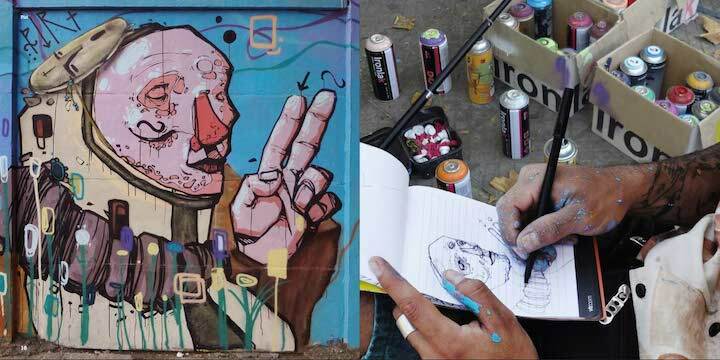 Why did you choose to focus on street artists? I had already been working on projects with artists and decided to make my new shop a mash-up of fashion and street art. Street artists have always had my respect, and they quite amuse me. They are a certain type of character – bold, independent, determined. That’s inspiring to me. The walls of my shop have been painted, stenciled and wheat-pasted by street artist friends. I had asked them to do their own personal heroes, keeping their own original style. What inspired the particular title — In Heroes We Trust— of both the shop and the book? I came up with it some years ago driving solitary along an ocean road listening to the David Bowie song ‘Heroes’. It really speaks to me at core level – the idea of being a Hero. Not in a grand gesture way, but in terms of living life daily as a Hero to oneself, and ultimately to others. Being human isn’t always easy, but if we can do our best to be the best versions of ourselves and share that with others, perhaps we can all get along better, live fuller. I had my favorites, of course, and I did a lot of research. I looked for the talent, the message behind the work and the artist’s integrity. Did this project pose any particular challenges to you? I had to keep my nose to the wheel to track many of them down, as their contact info wasn’t always easily accessible. How did the artists respond — as it’s not the usual question posed to them? Most artists seemed excited about the project right away. In a few cases, an artist had said No at first; however, with more communication between us, we came to understand one another and what this was about. The artists get hit up a lot by various projects and surely it’s not always clear what’s what and who’s who. They need to protect themselves. It was definitely a wonderful learning experience in communication. And I had such a great team at Knock Knock – my editors Jamie Stern and Erin Conley, who were of great support and positivity behind the scenes. They really trusted me to do my thing, and that meant a lot. Did any artist responses particularly surprise you? Yes, one in particular. One artist’s manager wrote back quite a strict reply saying that the artist would never do such a book for the benefit of promoting my shop. I explained that this was a real gift for all of us that the publisher had offered us. Basically — a book showcasing them and their work on another, more personal, level. Sure, the book will shine light on what my shop is doing – which is to promote artists. And I am thrilled about that! I’m similar to them in that I’m a one-person show… getting by on what I love to do. Collaborating and supporting one another is really IT. It’s how we move forward, follow our passions and live what we are here to do. What was the outcome? Did you successfully convince this particular artist’s manager? Yes! That artist did join the project and is featured in the book. How has the response been to the book? All of us here who have seen it love it. From what I’ve seen firsthand, people think it is a beautiful little book of inspiration. And the artists who have seen it have said they are honored to be included with so many other artists whom they admire. For me, that was surely my hope. I wanted to present the best of the best and for all the artists to feel proud of their work in the company of their peers. In high school, I kept a photo of Joan Rivers with Boy George on my locker door. I loved that they both caused such controversy by being outrageous. I know Joan got pretty crazy into the insults later in her career. However, she opened up so many doors for women in the entertainment industry and beyond; in her generation women held back, but she didn’t. And Boy George just rocked his style and sexuality like no one. He let freaks be freaks! The two of them were good friends and that was also pretty cool – kind of two people you wouldn’t expect together. I’m interested in these kinds of people who don’t give a f*#k about normality. They break barriers for the rest of us. Today we have Martha Stewart and Snoop together – and I love it. It’s a great example of people connecting beyond age, race, upbringing and past lives. 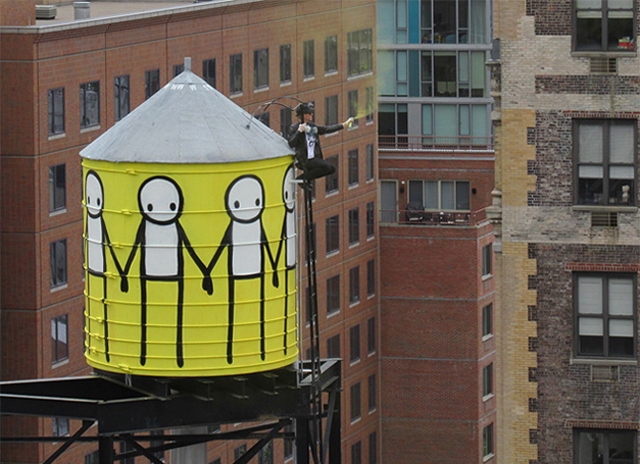 We’ve been huge fans of Stik and his distinctively singular — now iconic — character since he first visited NYC several years ago. We are delighted that his first book that was released in the UK last year is now available here throughout the US. 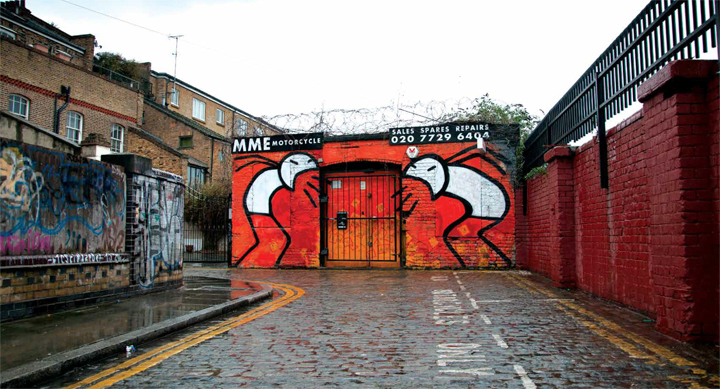 Featured in STIK are dozens of artworks ranging from unsanctioned pieces on the streets of East London — painted when the artist was homeless — to huge international murals across the globe. All are fashioned from six lines and two dots, the style Stik began when he had to paint quickly to evade the authorities. 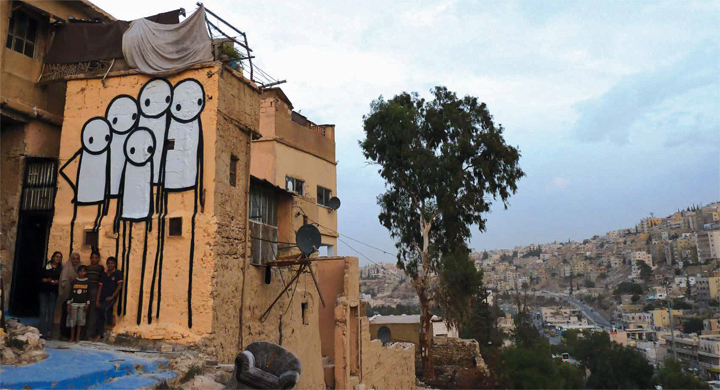 Described by the artist as “a journal of the progression of the Stik Project,” STIK is a fascinating journey into the artist’s consciousness and aesthetic. 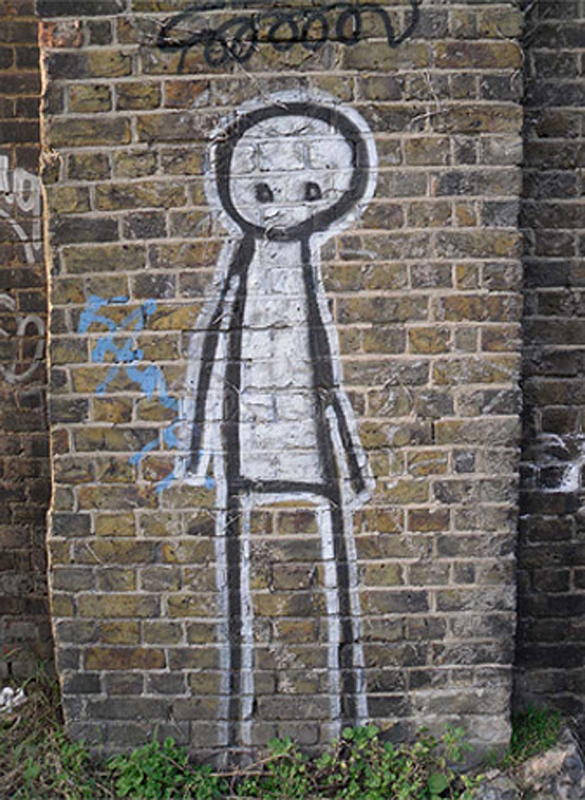 Stik’s strong social mindfulness and acute political awareness are evident in this first collection of his works, as he increasingly devotes his talents and energies to a range of causes, often working in collaboration with children and members of vulnerable communities. With over 200 heavy gloss pages and an exclusive, limited edition print, the book — published by Penguin — has now made its way into bookstores across the globe. 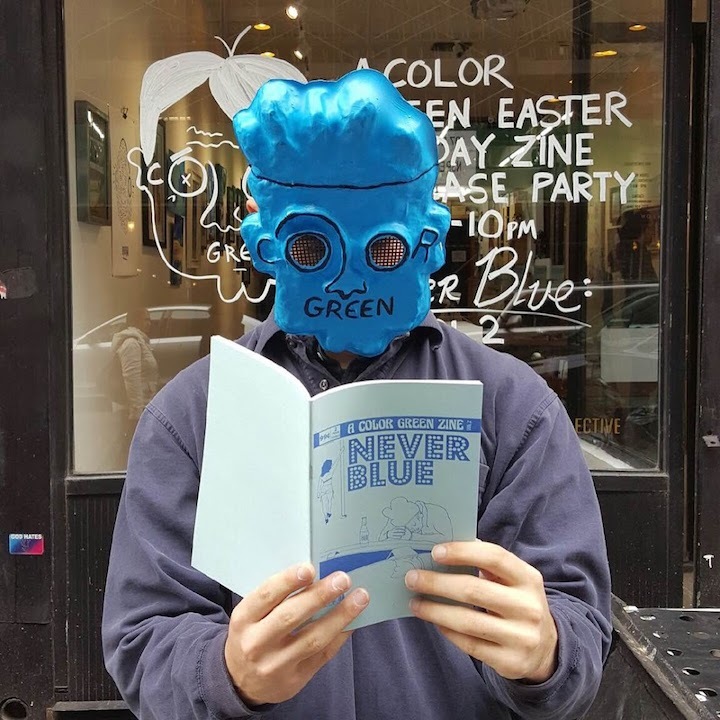 You can meet Stik and purchase a signed copy of his book with an orange or teal print — exclusive to the first US edition of the book — tomorrow, Thursday evening from 6-8pm at Strand Books, 828 Broadway on the corner of 12th Street. 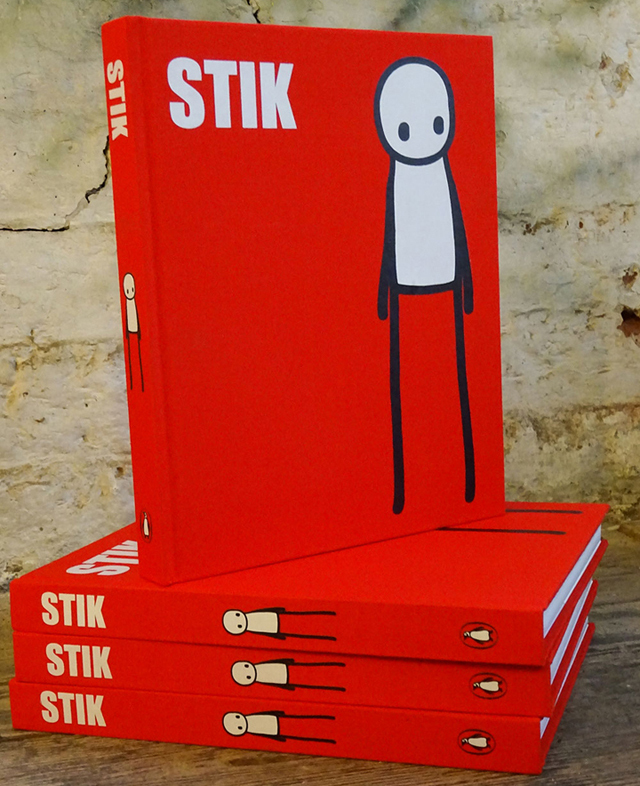 Anyone who buys a copy of STIK or brings in a pre-purchased copy of the book for Stik to sign at Strand Books is eligible to enter a lottery to win a pair of artist’s unfolded, card stock Stik posters, signed by Stik himself. The posters, one orange and one blue, are number one of only five artist’s proofs and depict the same image seen on the book’s cover. 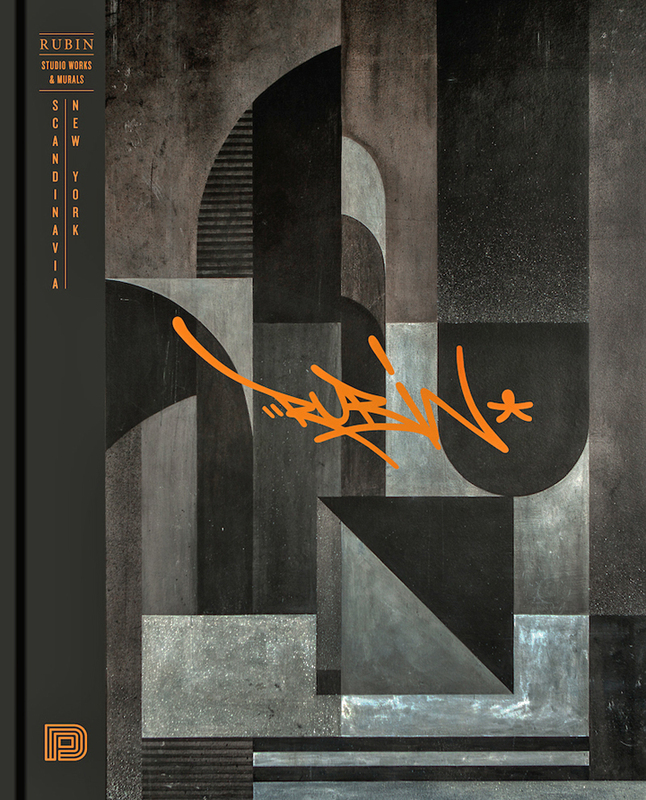 Recently released by Dokument Press, RUBIN NEW YORK SCANDINAVIA is a stunning survey of Rubin‘s distinct abstract and geometrical artworks that are rooted in traditional graffiti. With dozens of images documenting Rubin‘s journey — from Sweden, where he grew up, to NYC, where he is now based — Rubin New York/Scandinavia offers an overview of the works of an exceptional artist, who has brought a singular beauty to our NYC landscape. The book’s succinct text by Björn Almqvist introduces us to Rubin’s experiences as a child of Finnish immigrants who made their way to Sweden in search of work. 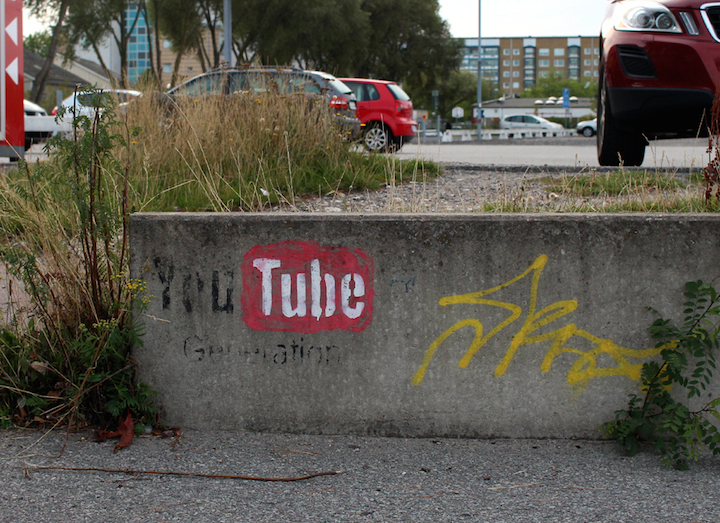 The alienation that Rubin felt among Swedes, along with the stark grey concrete walls of the housing complex that enveloped him, were calls to pick up a can and make a mark. Inspired by Scandinavian design, Rubin has developed a unique aesthetic that uses geometrical, symbols in lieu of letters. 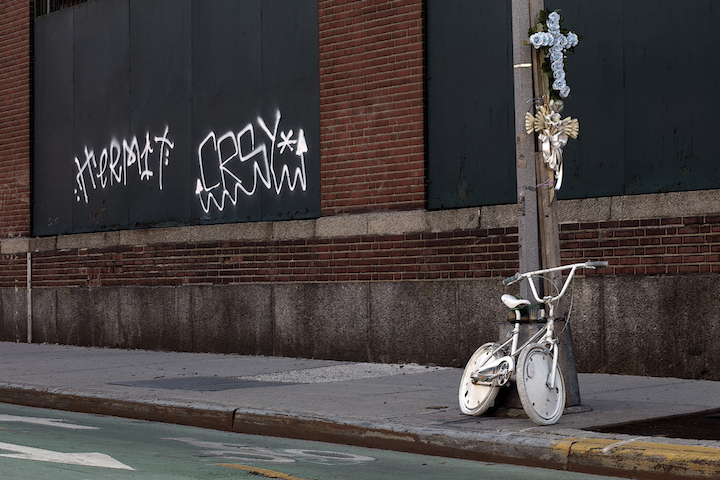 With his splendid craftsmanship and unique aesthetic, he transforms the gritty language of graffiti into his own distinct expression that is as effective on the streets of the South Bronx, as it is inside a church yard or on the outside of a Manhattan boutique. Rubin New York/Scandinavia also provides us with a handsomely curated survey of Rubin’s studio work that has been increasingly making its way into galleries. Rubin New York/Scandinavia is a splendid ode to a distinctly wonderful artist. 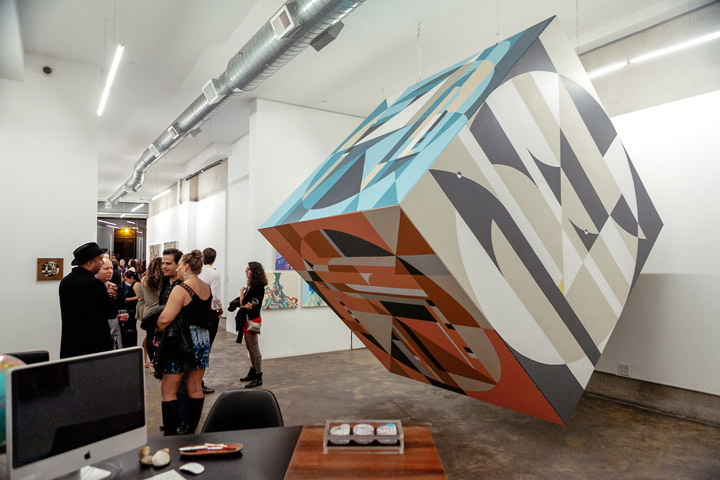 Its NYC release took place last month at WallWorks, where the artist’s works remain on exhibit through June 29th. 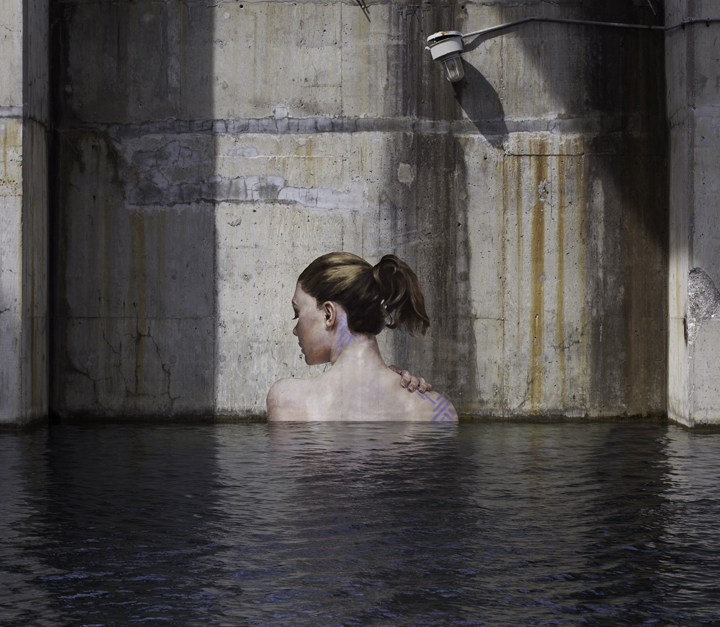 Currently based in Sweden, Peter Bengtsen is an art historian and sociologist who has been researching street art for the past nine years. 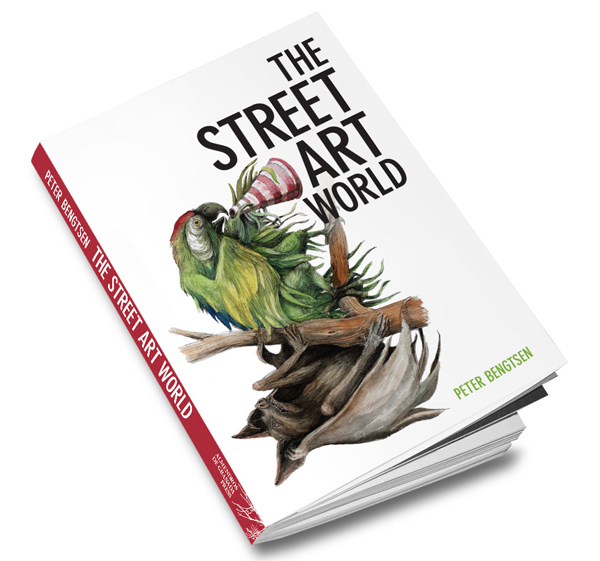 The Street Art World, a 248 page book, is the result of his research based on studies of everyday interaction among artists, gallerists, collectors, bloggers and street art enthusiasts. I recently had the opportunity to read Peter’s engaging book and pose some questions to him. 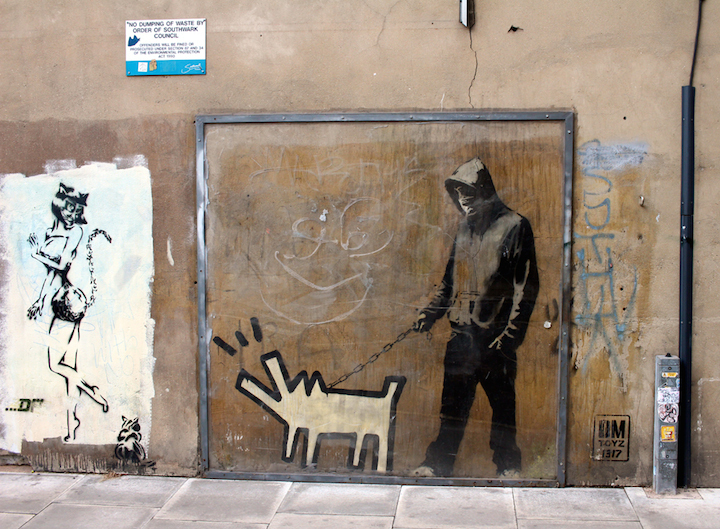 When and how did you first become aware of street art? 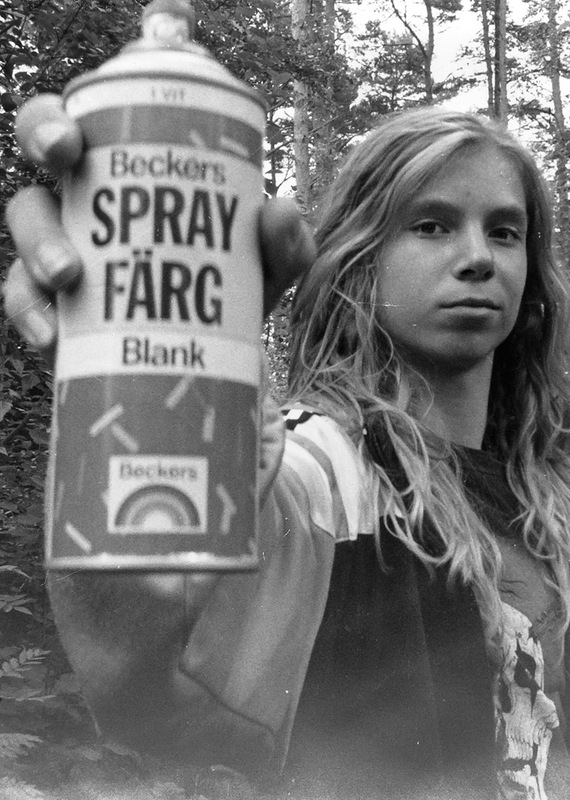 I grew up in a small town in the Danish countryside, with virtually no exposure to graffiti or street art. As a kid I would sometimes see throw-ups by Tower and Carn in the underpasses when driving with my parents on the freeway, and those names have been stuck in my head ever since. 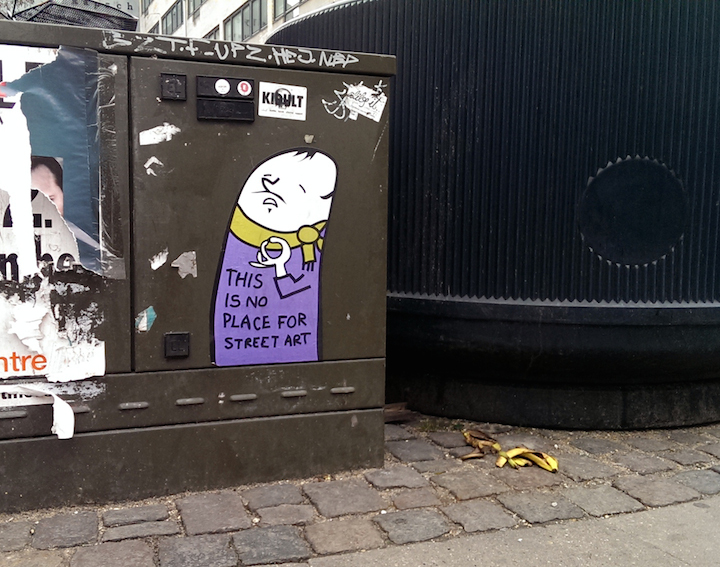 It wasn’t until I moved to Copenhagen in 2000 that I really became aware of street art and graffiti, though. You write that when you first discovered street art, you did not deem it “worth documenting and preserving.” What changed your mind? When I say that street art wasn’t worth documenting, what I really mean is that for a while the immediate and brief encounters with the work on the street were enough for me. 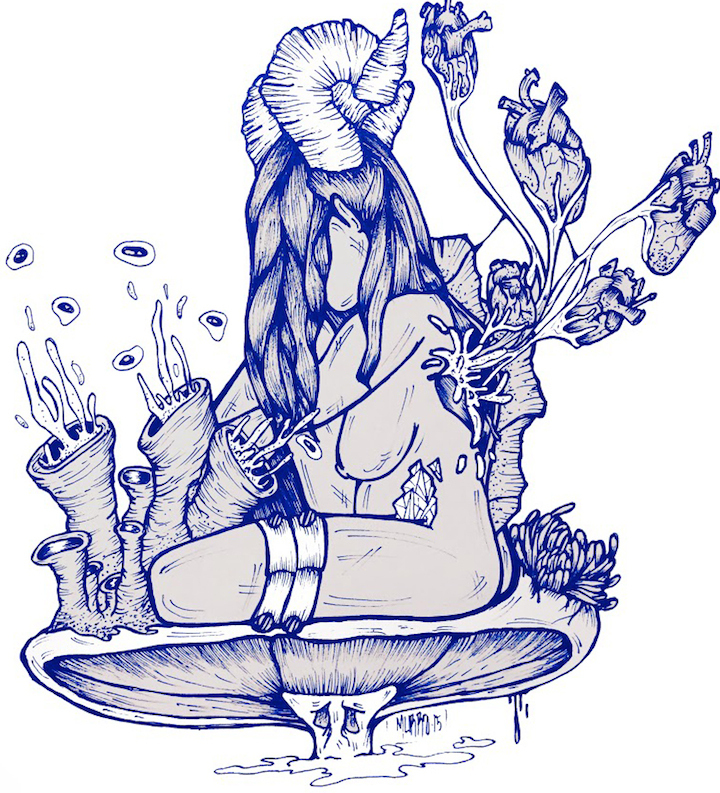 However, over time I started getting attached to some of the artworks I passed regularly, and I also began recognizing the work of certain artists like HuskMitNavn and later Armsrock and Faile. I found myself feeling a bit sad when the artworks eventually disappeared, and I felt an urge to somehow keep them. Photography was one way of doing that. The technological developments around that time had a lot to do with making this form of documentation possible. Back in the early years of the 2000s I was using a film camera and I couldn’t afford to photograph graffiti and street art, but that changed when I got my first digital camera in early 2005. 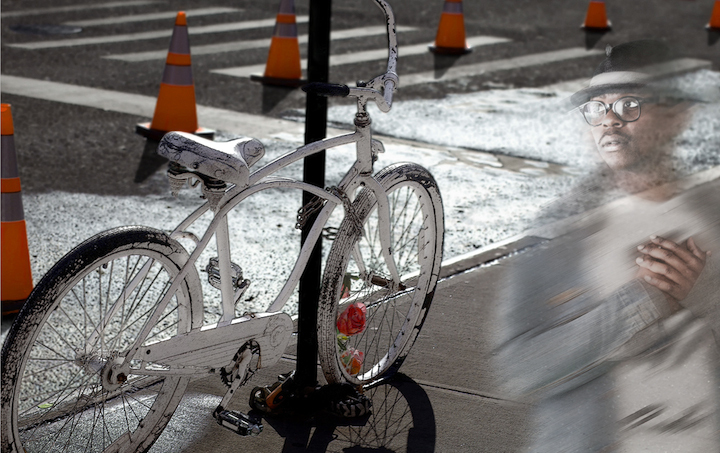 When it comes to preserving street art, I am still conflicted. As an art historian, I see a value in keeping material examples of street artworks for posterity. However, a key part of street art for me is that artworks are transformed over time, because the street is open to change and dialogue. 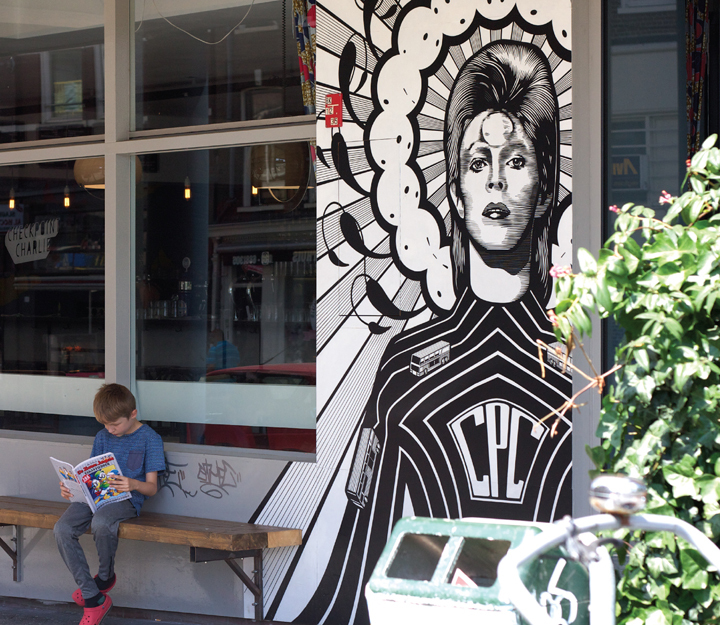 When street artworks are placed under glass or cut out of walls to be preserved in a more controlled environment that openness is taken away. In preserving street artworks, I think one of the essential things that set street art apart from other art may be lost. 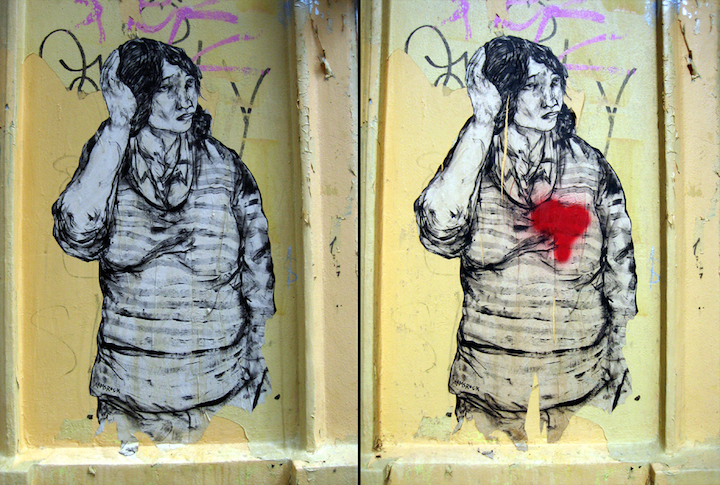 As an academic, what are some of the challenges you face when researching and writing about street art? Even before I started my research, I found expressions of a rather strong anti-intellectual and anti-institutional mindset in the street art world. These public expressions have become less dominant in recent years as street art gets more integrated in the mainstream art world. 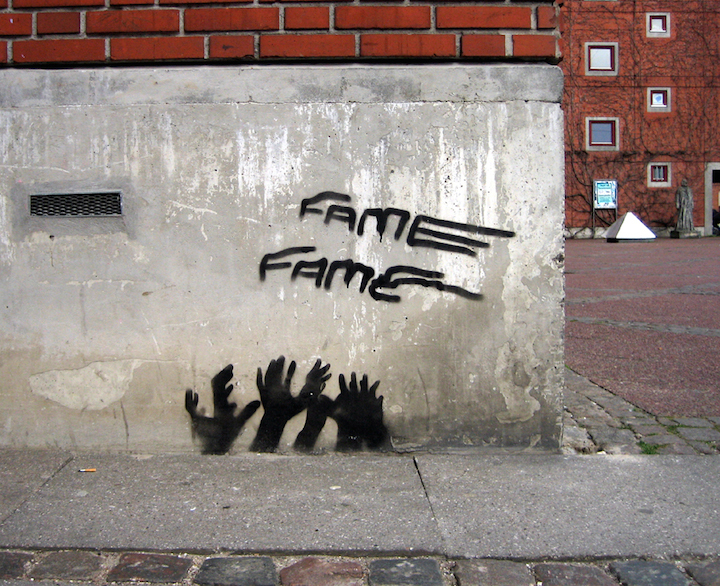 However, academics that are seen to attempt “investigating” street art – rather than actually engaging with the art and the social environment that surrounds it – are sometimes still looked upon as a species of “culture vulture,” swooping in to pick the bones of a social and cultural environment they know little about. Over the years I have seen researchers fail in their work because they lacked a fundamental understanding of the social rules of the field they were trying to study. To mitigate the critical attitude towards academic researchers, and the institutional art world they are seen to represent, I think first impressions are very important. 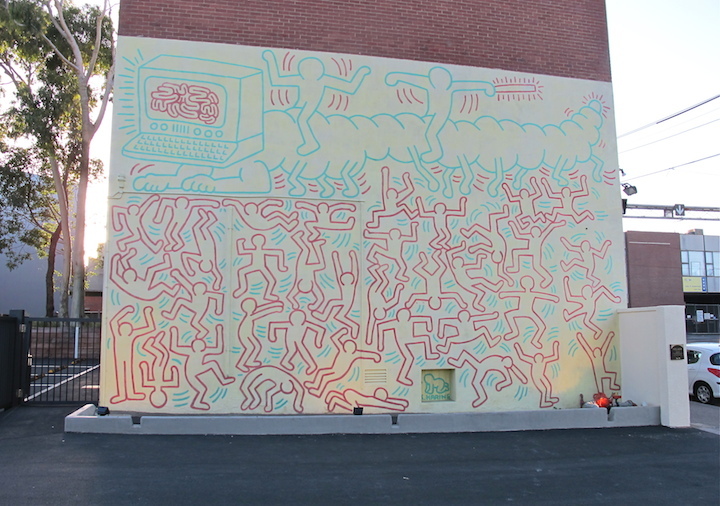 In my own case, because my interest in street art was not academic to begin with, I had already been socializing with other street art fans for some time when I started doing formal research in 2006. 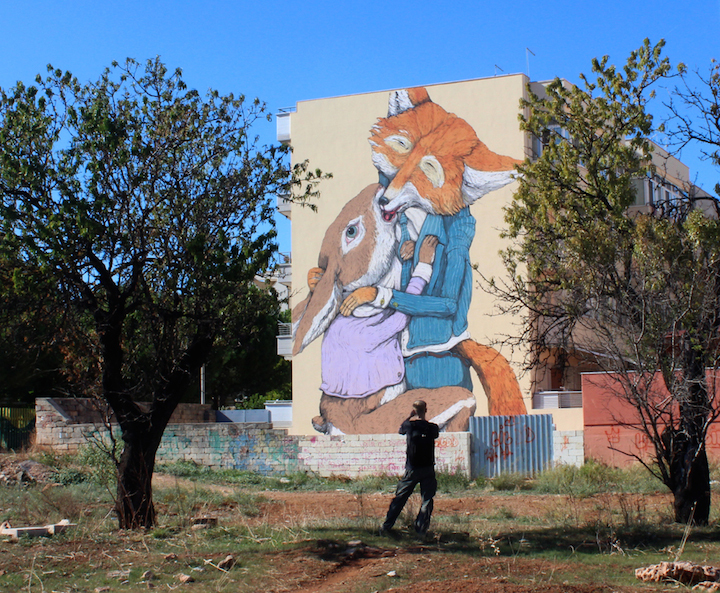 While I have still met some skepticism and received derisive comments regarding my role as a researcher and my attempts to intellectualize street art, I think the connections I already had with other enthusiasts made it a lot easier to move forward with my project. If I had come from the outside with a research agenda, things might have been different. 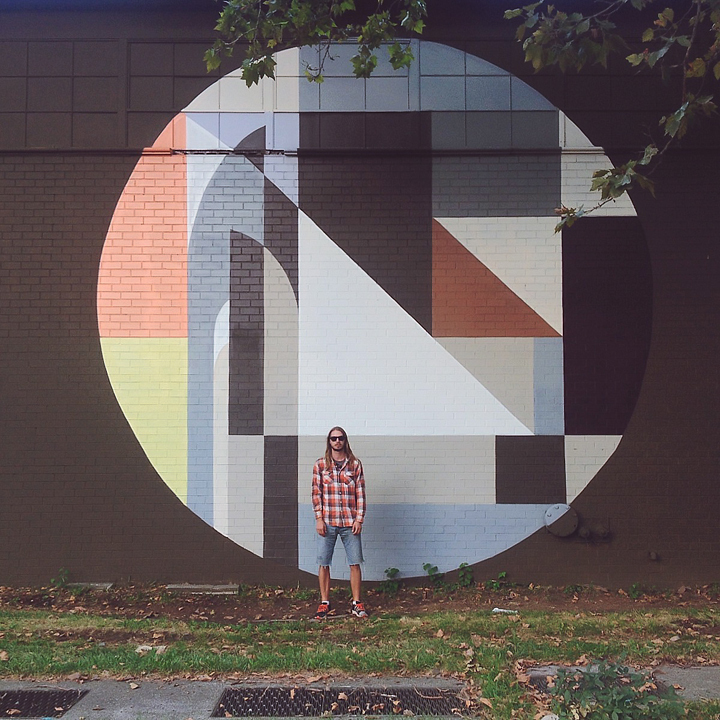 How have other street art enthusiasts – from bloggers and collectors to the artists themselves – responded to your academic approach to the subject? Apart from the skepticism I already mentioned, people have generally been very positive during the research project. When I was working on the book, I had a lot of help from people who provided me with viewpoints, information, and – very importantly – photographs of artworks I couldn’t get to myself. My research budget doesn’t allow for expenses related to image rights, so if people hadn’t been so generous and willing to let me use their images, the book would have ended up looking very differently. In terms of the finished book, the response has been overwhelmingly positive. I was confident I had created a solid piece of scholarly work, but it was also very important to me to write something that people outside the academic world would be interested in reading and could relate to. 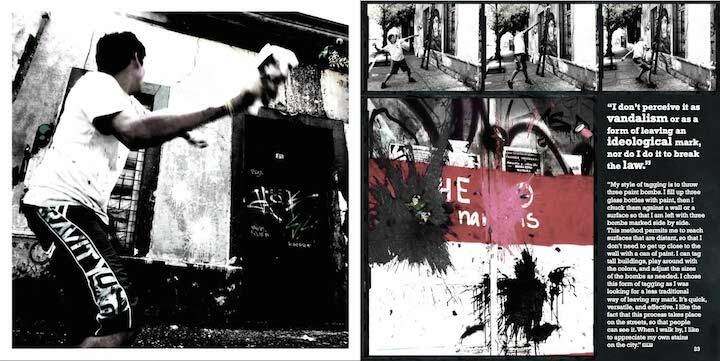 From the comments I have received, street art enthusiasts enjoy the book and recognize the world I am describing. This doesn’t mean they always agree with everything I write, but to me that is really great. My goal with the book was never to present the “truth” about what street art is – I actually don’t believe one such single truth exists. 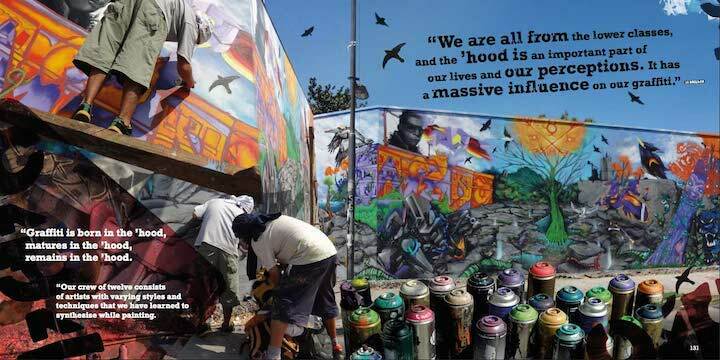 My hope was that the book could be part of an ongoing dialogue about street art, and critical engagement and disagreement are essential to that. What are some of the changes that you have observed in the street art “world” since you first began documenting it and writing about it? 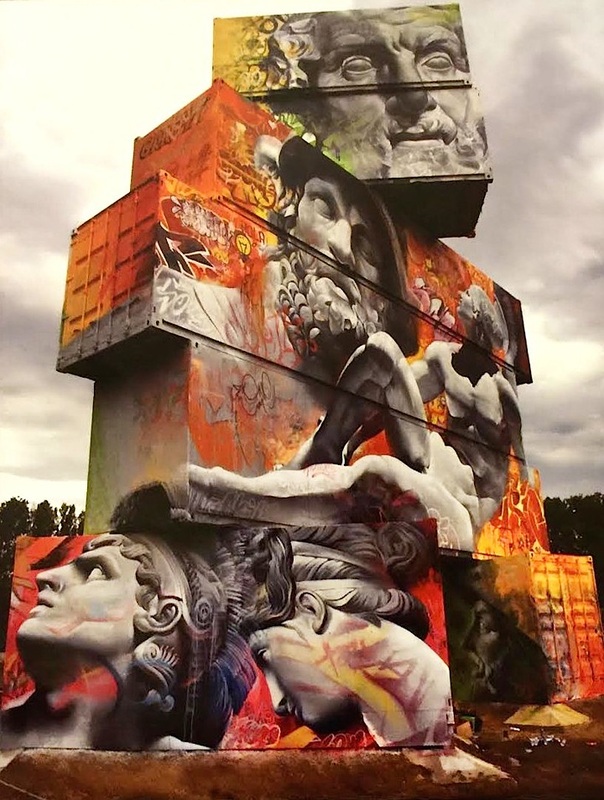 One of the most significant changes is that the street art world has become increasingly professionalized. 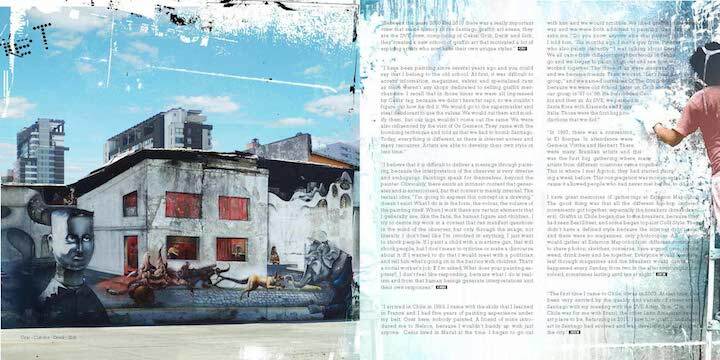 This can be seen in for example the establishing of commercial magazines dedicated to so-called urban art, the increasing number of print houses and galleries that produce and/or sell limited edition artworks, the companies around the world that arrange commercial street art tours, and the vast number of street art festivals that have popped up in the past decade. With a more professional system in place, I think it has become easier for some artists to make a living from their work. 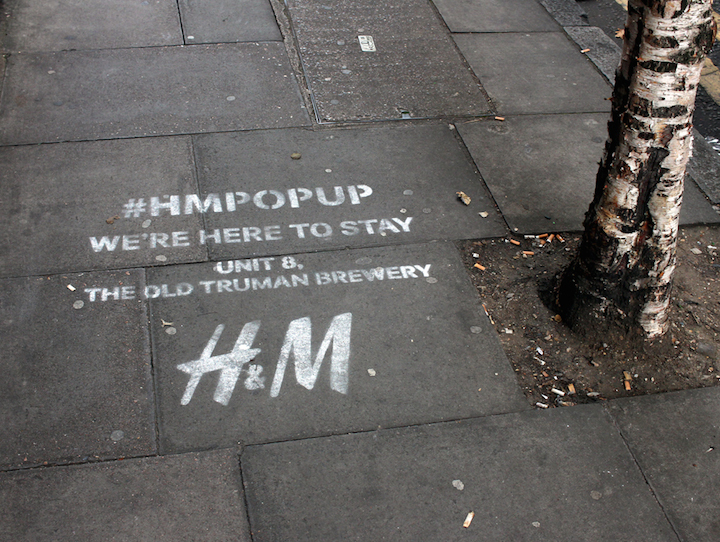 While this is a positive development in many ways, from a personal point of view I do find it tiresome that some artists now seem to consider doing street work simply as a way of promoting their commercial wares. This is for example reflected in the number of websites and social media handles that are now included in, or placed next to, work in the street. 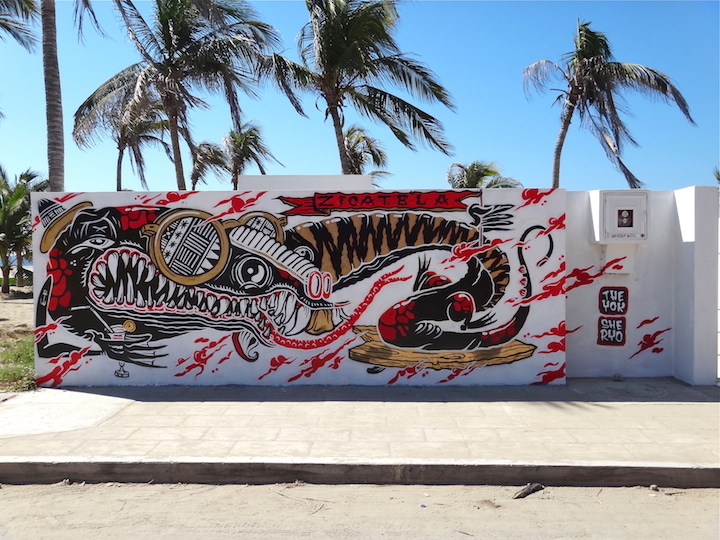 Along with the professionalization, street art enthusiasts seem to have become increasingly focused on the market value of commercial products. I see this very clearly on street art forums. Members have always discussed the value of their collections, but investment potential has gradually become the main focus since 2006, when urban art really started becoming a thing with galleries and auction houses. I think this development may partly represent a change in attitude among the people who were into street art when I first started out with my studies, but I strongly suspect it is also because a different demographic has taken an interest in street art and/or urban art as an investment object. Sadly, it seems to me that critical discussion about the art itself has largely been quashed by the market. What are some of the key factors that have contributed to these changes? 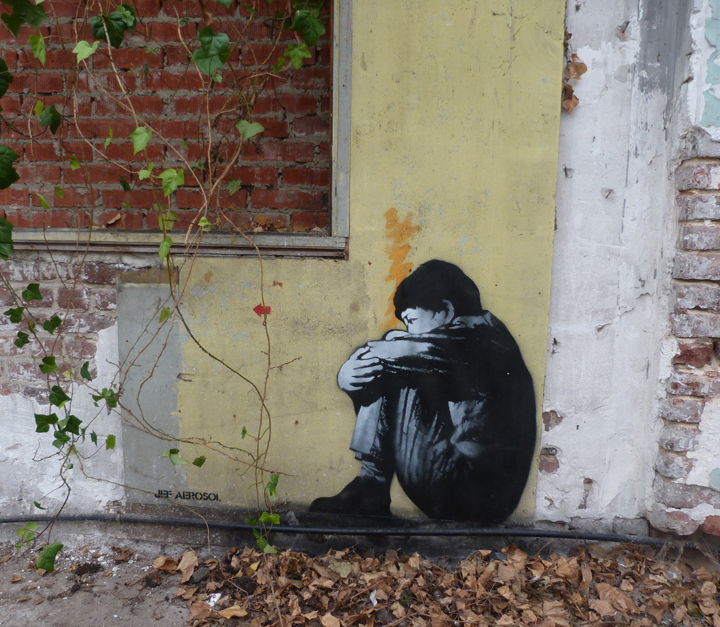 Money obviously has a lot to do with the way the street art world has developed. 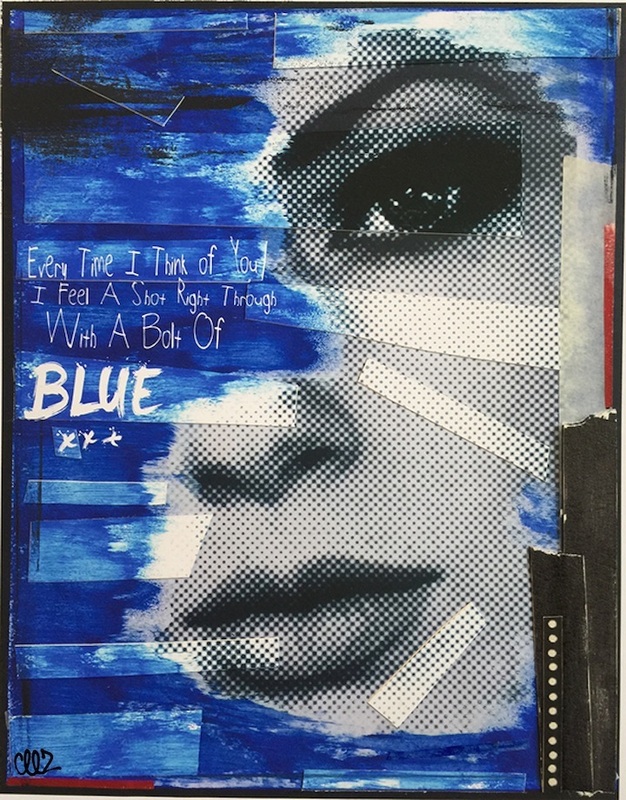 With the increasing recognition and popularity of street art/urban art, it has become big business for some to provide a growing customer base with consumable products like limited edition screen prints. 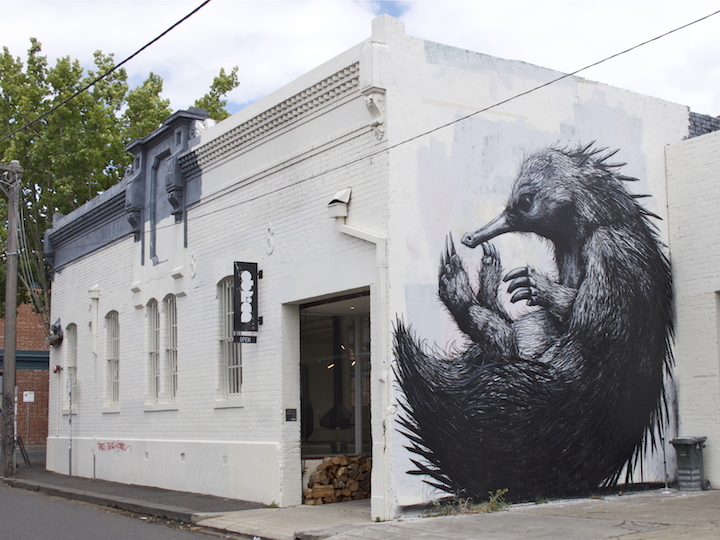 As a result, a growing number of print houses are constantly on the lookout for new artists, and it is not uncommon to see prints from artists who have done very little street work. This is in part possible because artists today make very conscious efforts to be “discovered” quickly, for instance by placing their street work in highly photographed areas and by leaving their contact details in or next to the work. Having witnessed the market success of some of the older generation of street artists, it is perhaps not surprising that members of a new generation see doing street work as a shortcut to a commercial career. Lack of experience and maturity on the part of these artists may be one reason a lot of the commercial work released today is very formulaic and/or blatantly rips off previous work by other artists. Despite this, much of the published work seems to sell out. It is hard to say whether this is because customers actually like the artwork, and perhaps are unaware of the source material, or because they don’t want to miss out on what is often deliberately presented to them as an investment opportunity. However, the number of prints on the secondary market is an indication that a lot of customers do see their purchases as investments. 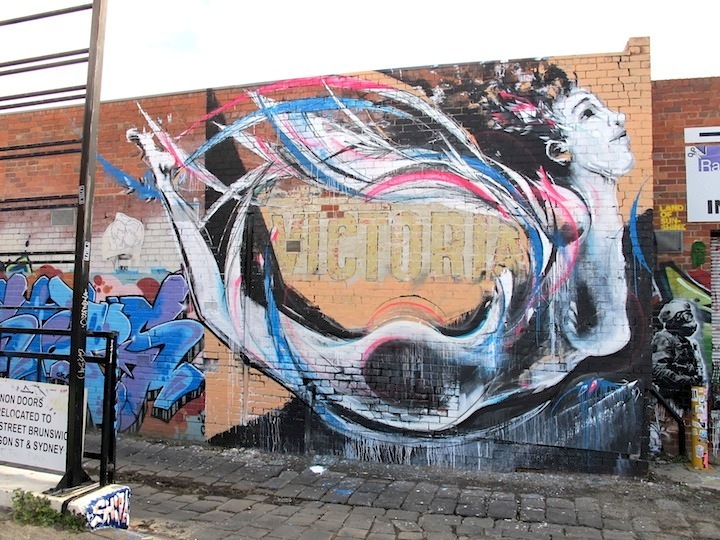 Apart from money, technological developments have profoundly influenced the street art world. Digital photography and videography has made it simple for people to create visual material, and the internet in general – and social media in particular — enables people to share what they, and others, produce. 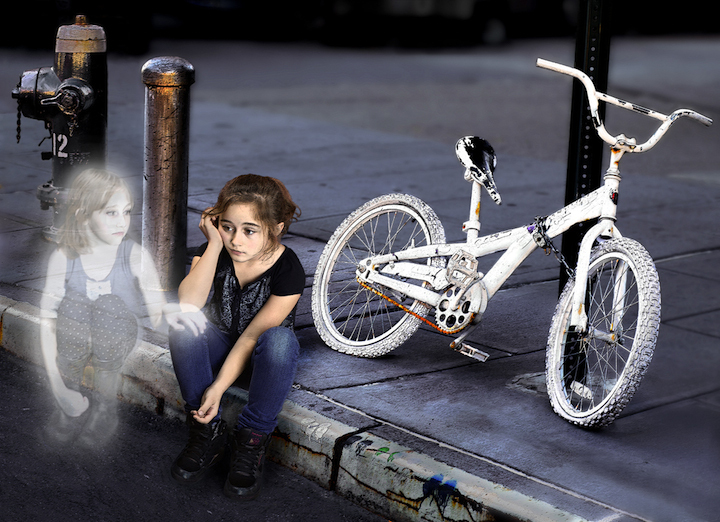 I think the ease of sharing content has played a very important role in the developments seen in the street art world. It is to a large degree through the online sharing of visual material that the interest in street art is spread to new people. 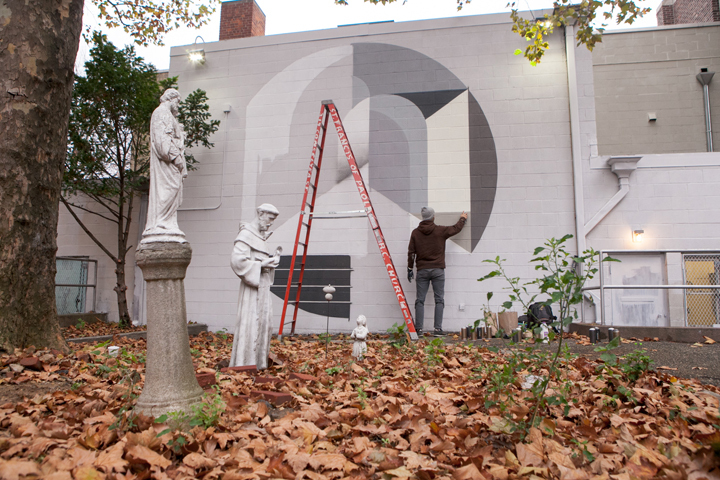 These new enthusiasts — and potential consumers — form a basis for the continued existence of the marketplace that now constitutes a central part of the street art world. 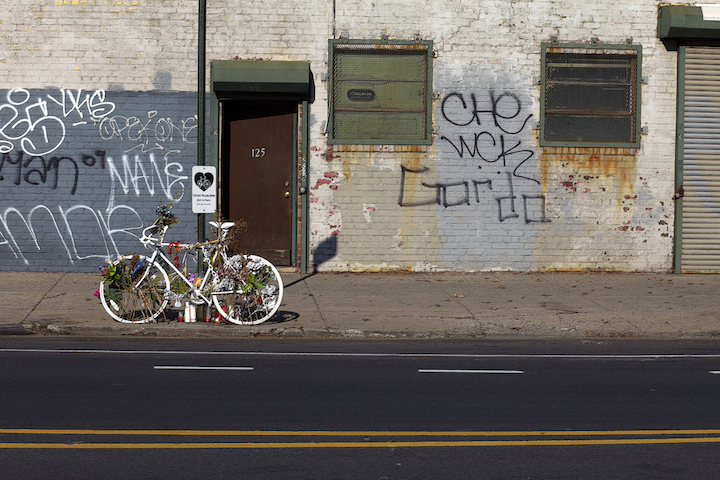 Is street art dead? Or is it just sleeping? I would say that all depends on your definition of street art. 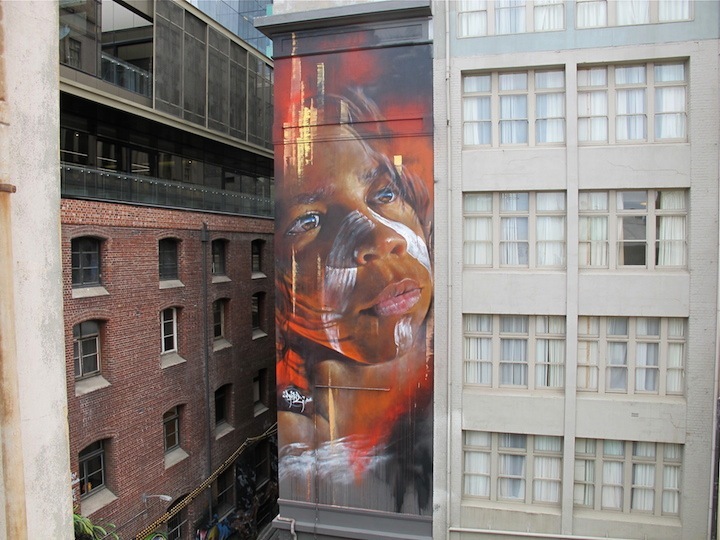 The notion of the death of street art comes about when someone experiences a conflict between a specific, subjective ideal of what street art should be and what they think it has become. The statement “street art is dead” has been popping up at regular intervals for as long as I have followed the street art world, yet people are still making, documenting, discussing and trading what they call street art. Although the street art world has become more professional and commercially oriented, much to the frustration of some, I don’t think this implies that street art is dead or even dying. 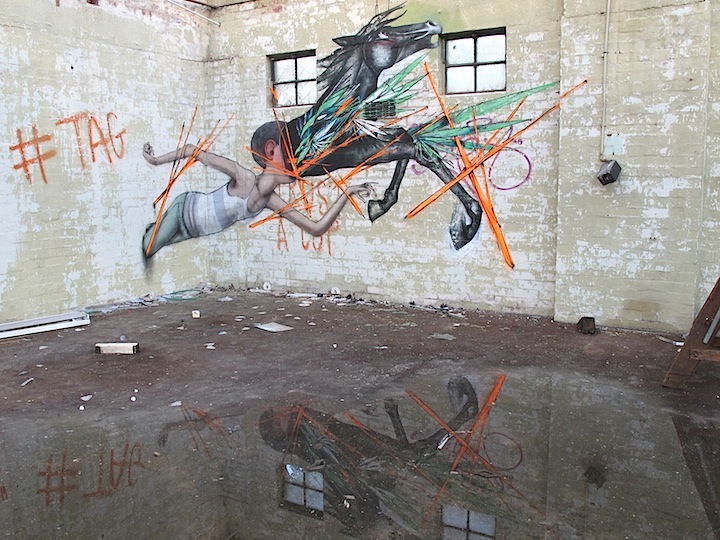 It simply means street art – like all things – is evolving. Urban Art Legends, by the renowned graffiti writer, photographer, curator and author Alan Ket aka KET, presents 39 engaging profiles of key urban artists, along with photos of their significant works. 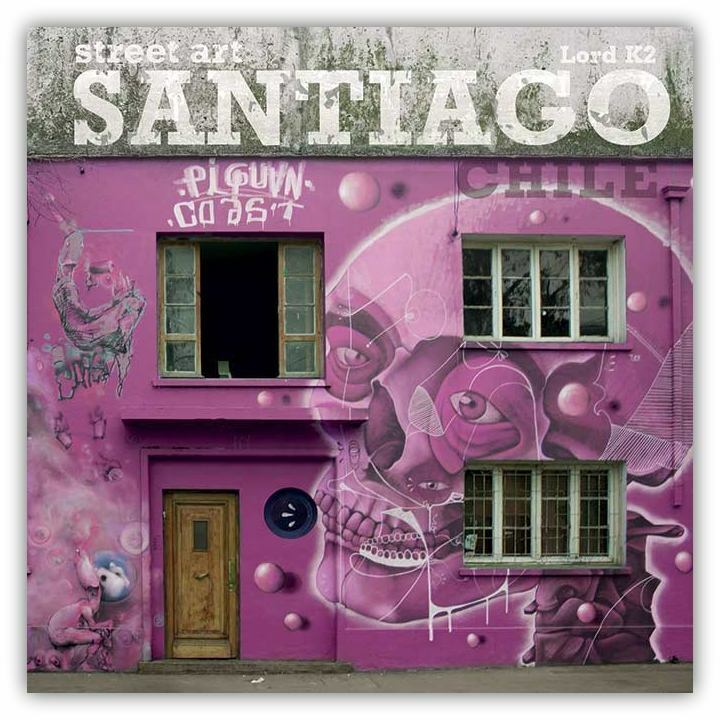 After a concise and informative introduction, in which he terms urban art as “this other art world,” KET introduces his readers to such pioneering and influential artists as ATOME, Futura, JON ONE, Lady Pink, Mode 2, Os Gemeos and Saber. Included in the artist profiles are: essential career highlights, defining artistic features, style evolutions, crew associations and specific creative projects, along with the artists’ engagement with the fine art world. 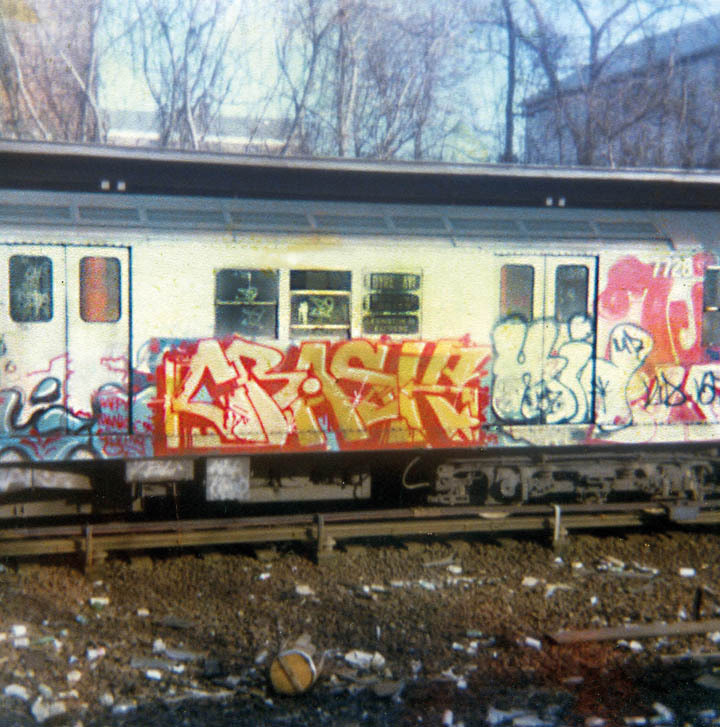 We learn, for example, that in addition to painting train graffiti, DAZE exhibited alongside Basquiat and Haring at NYC’s Mudd Club, lectured at universities and designed a train station — with Lee and Crash — in Germany. Iconic musicians such as Madonna and Eric Clapton have purchased his canvases and numerous museums in the U.S., Germany and the Netherlands have added his paintings to their collections. 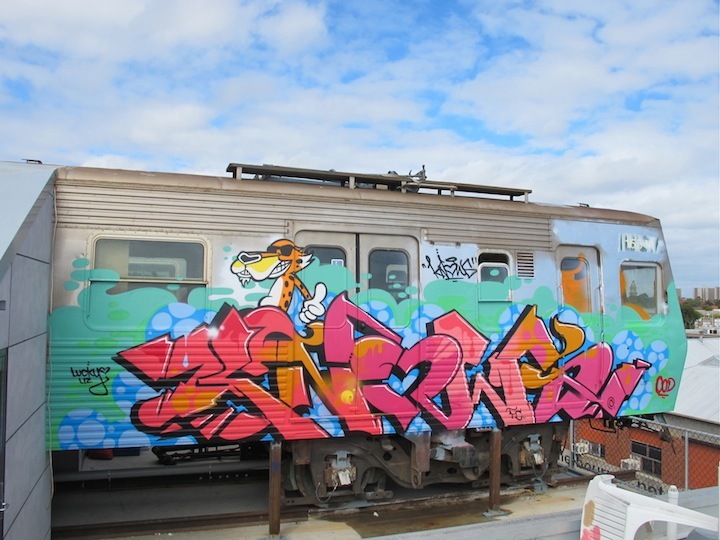 Crash, KET notes, pioneered the graffiti movement’s relationship with the gallery world with the exhibit, Graffiti Art Success for America, that he curated at Fashion Moda in 1980. He has since exhibited in museums throughout the world and partnered with a range of companies on varied projects. And he is now, once again, active on the streets. 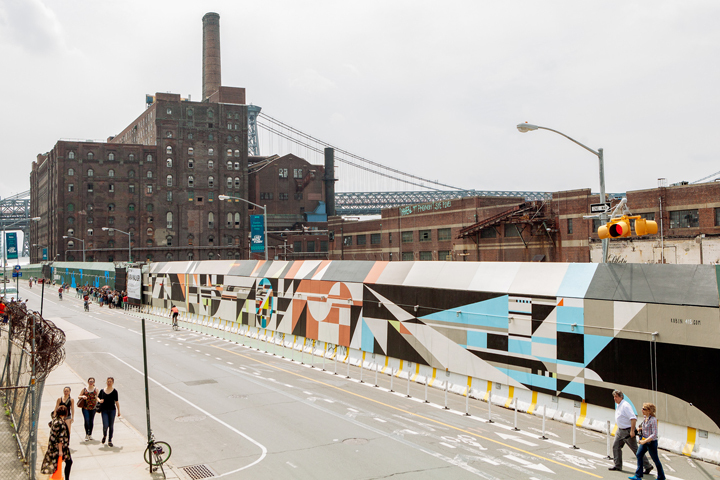 KET also selects some 20 artists — including Sane Smith, Risk and JON ONE — to whom he awards “legendary status.” We discover, for example, that Sane Smith was sued for three million dollars for painting a work visible for miles on NYC’s Brooklyn Bridge. Risk attains “legendary status” for being the first Los Angeles writer to paint a NYC subway train when he visited in 1978. And KET confers legendary status on Paris-based Harlem native JON ONE for receiving France’s premier award, the Legion of Honor, for his contributions to art and culture in France. 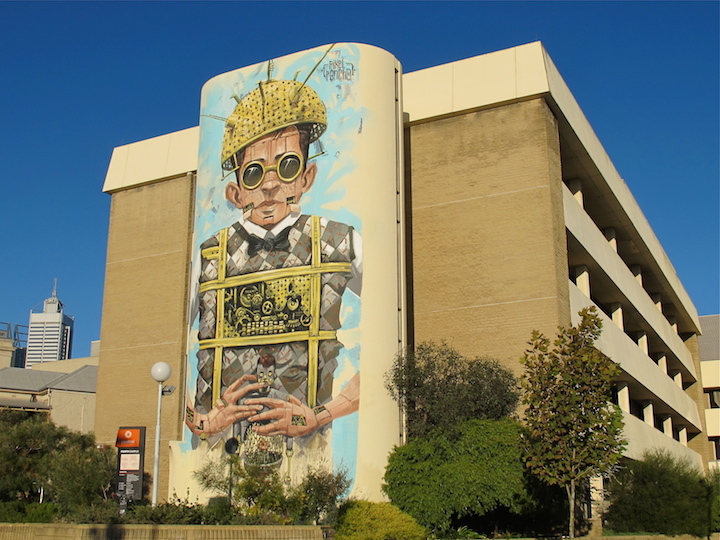 KET also seamlessly links the two worlds of street art and graffiti by telling the stories of individuals — such as Ben Eine and Os Gemeos – who have dual identities as both graffiti writers and street artists. 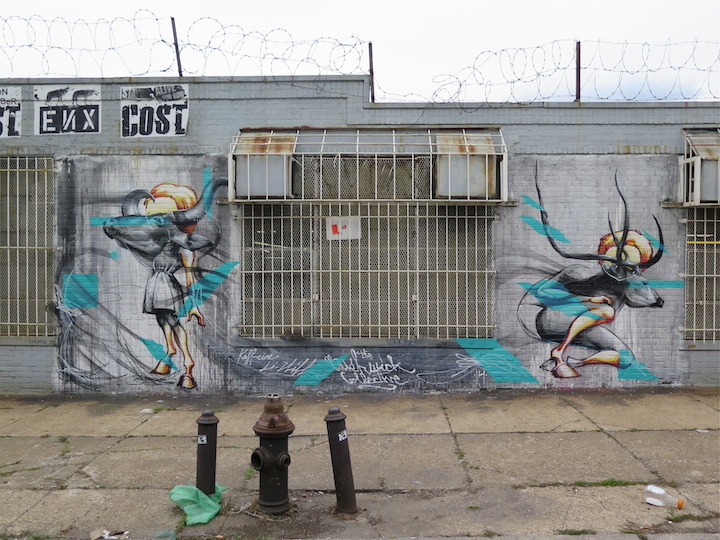 Urban Art Legends beautifully captures the diversity of artistic practices found in our cities — from subway trains to galleries and back onto the streets. 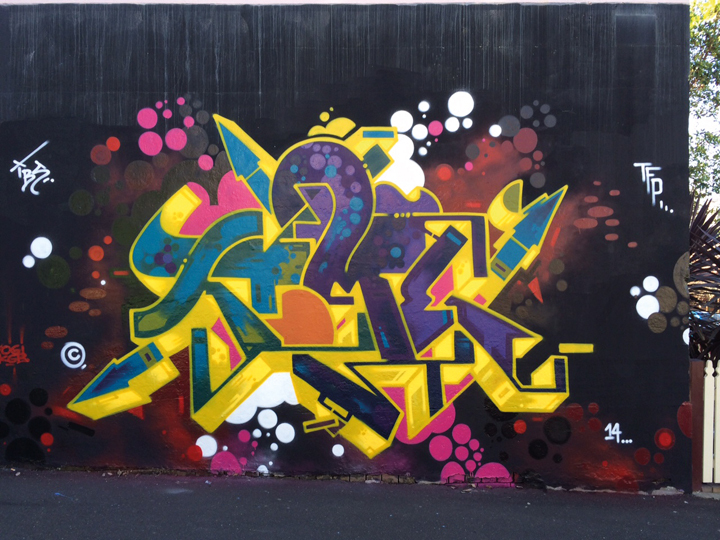 KET’s enthusiasm and passion for urban art pervade these pages as he writes that “justice cannot be done to all those incredible talented individuals who have informed and advocated” the urban art movement. Urban Art Legends certainly comes close, as it offers readers a solid grasp of over three dozen of those individuals who have significantly impacted the urban art scene. 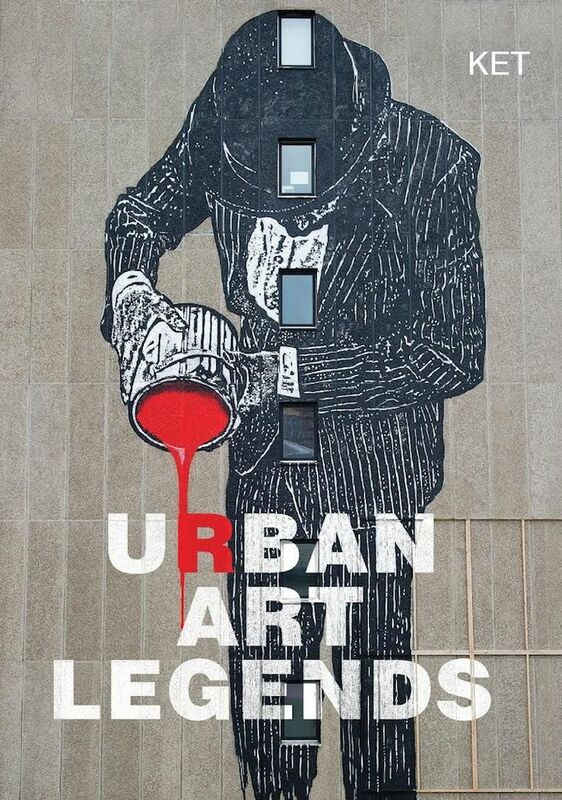 Published in the UK by LOM ART, Urban Art Legends is now available online and in most NYC bookstores. 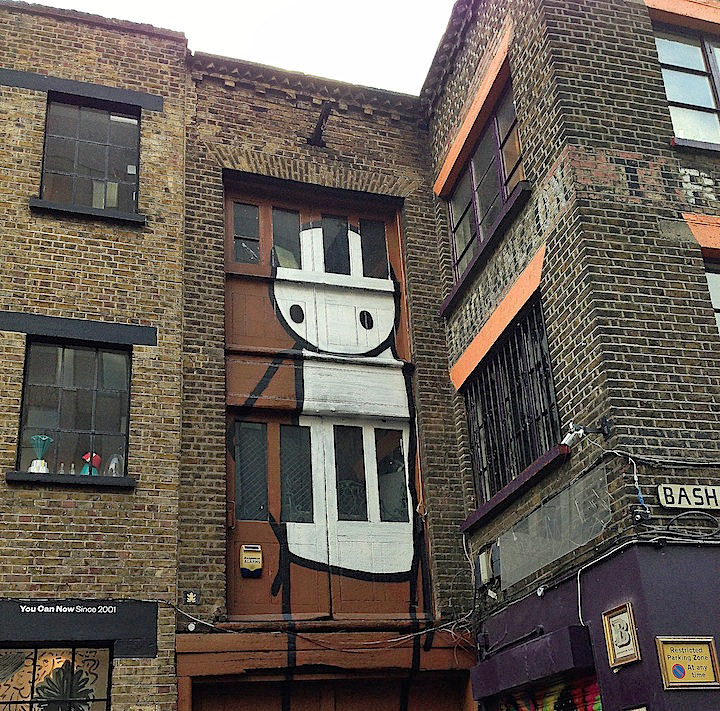 Known for his iconic life-size stick figures that have surfaced throughout the globe, East London-based Stik has attained celebrity status with Random House‘s recent release of his first book. While in London last month, I had the opportunity to speak to the artist. When did Stik first surface? And where? 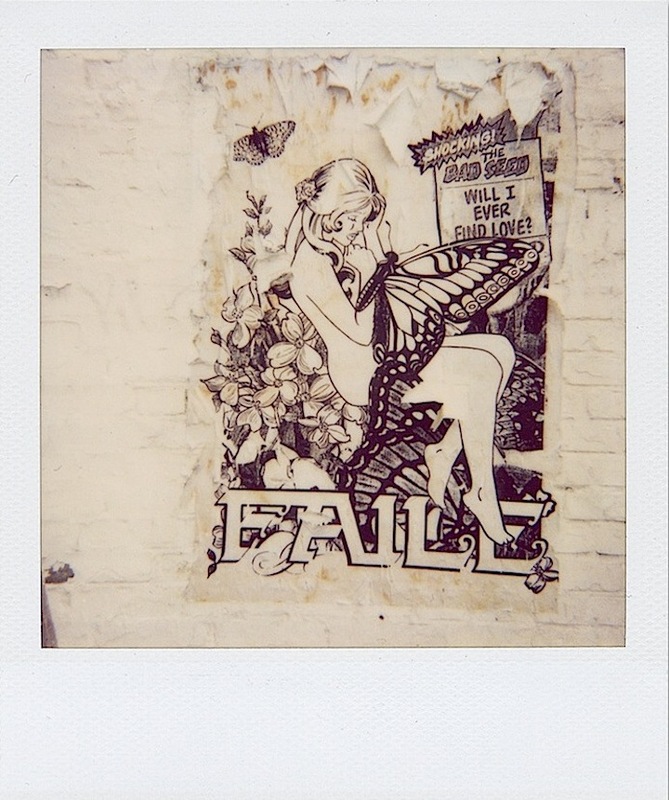 It was back in 2003 in Hackney Wick along the canal. It was the safest place to paint at the time. 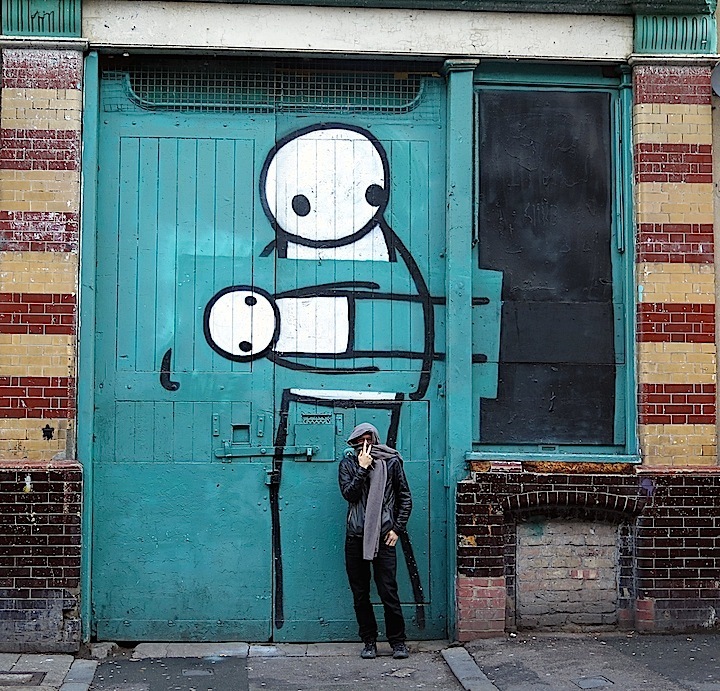 Can you tell us something about Stik’s origin? What was the concept behind it? 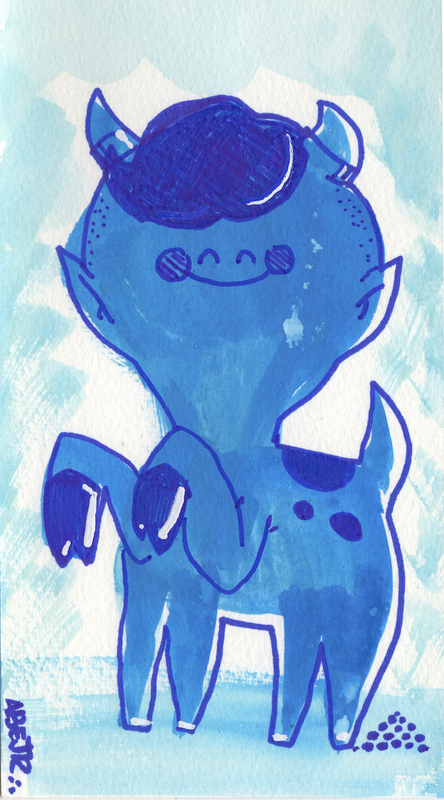 I came up with the idea of six lines and two dots simply because it was the quickest way to paint without getting caught. 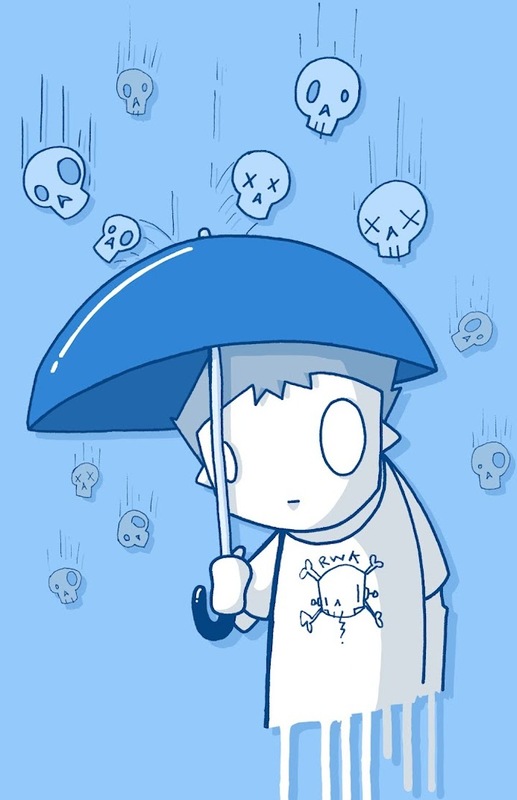 My first Stik drawing represented my struggle to find shelter and survive. While homeless, I had lost all my drawings. Anything I could get up on the streets could be seen, at least, for a time. How did folks respond to your work at the time? They liked it. They could identify with it. It especially spoke to lonely people. 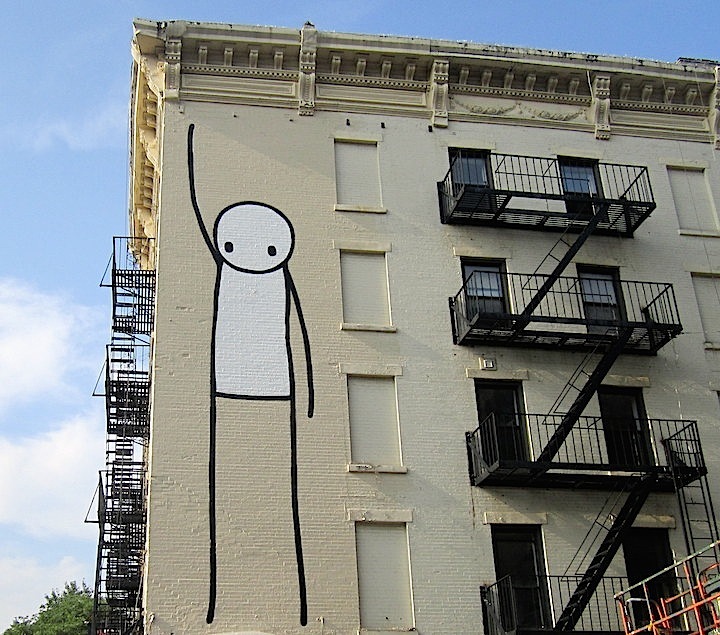 How has Stik evolved since it first surfaced? At first I only painted lonely people. 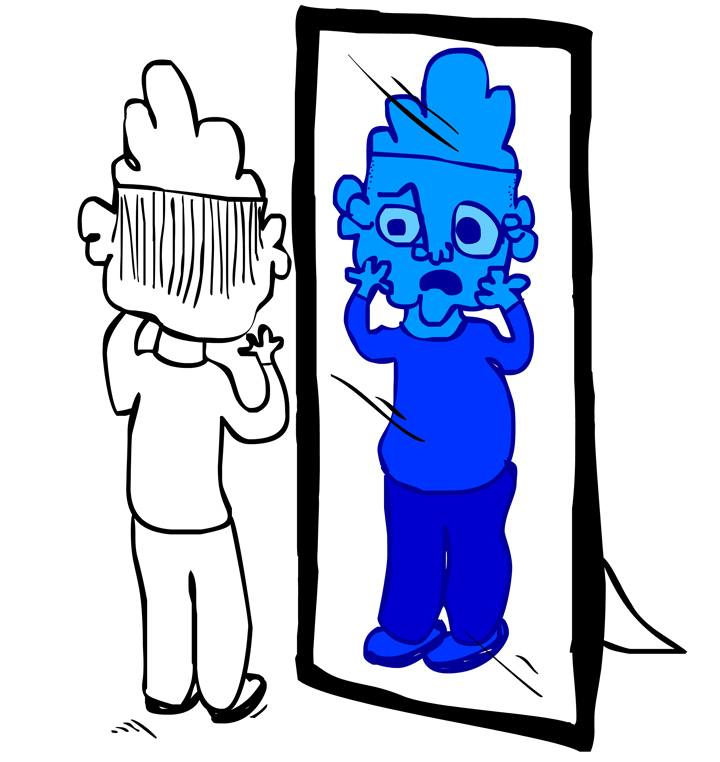 It was my way of reflecting on my personal struggles. Then as my circumstances improved, I became involved with causes and the figure changed as its context changed. What are some of these causes? 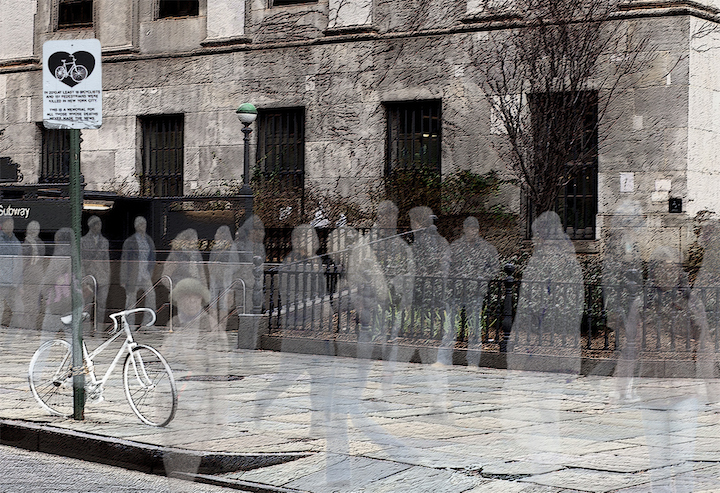 Homelessness, gentrification, the National Health Service, underground cooperatives and more. 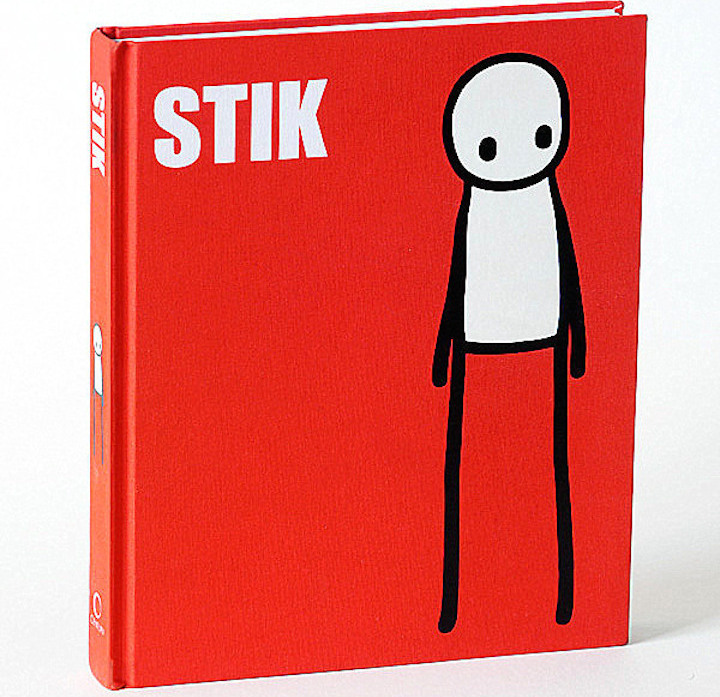 Your new book, simply titled Stik, is currently a best-seller in London. What was the concept behind it? It is a journal of the progression of the Stik project. Your book is so stunningly presented and has gotten such wonderful press in London. When did the idea of first publishing a book come to you? In 2010, while living in a homeless hostel, I was writing a monthly column for the Hackney Citizen that included a mural related to a news story. I did this for a year, and it made me think about articulating meanings. Any plans to visit NYC? Yes! I plan to visit NYC in the spring. That sounds great! We are certainly looking forward to seeing you again in NYC!